Two majestic Griffins, made of richly detailed antiqued gold brass, guard their priceless treasure - the sun. This being a stunning Topaz Swarovski crystal which becomes an elegant focal point in this limited edition design. 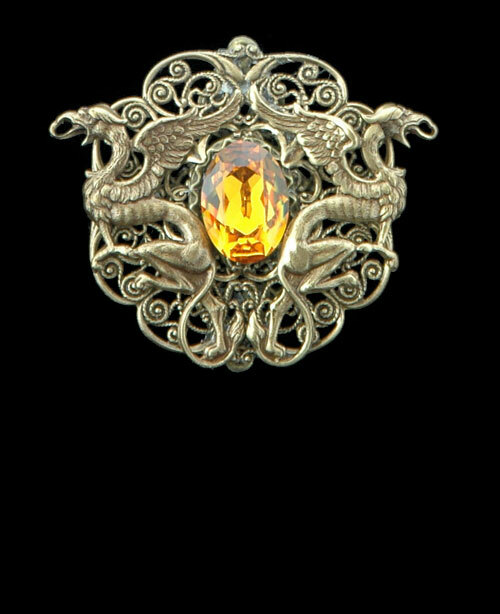 Half eagle, half lion these Heraldic creatures rest on layers of antiqued gold filigree to come together in this beautiful Fantasy design. This piece doubles as a brooch or a necklace. Just attach your favorite chain to the back tiny loops.